No matter what type of website you run, you’ll find that most of your traffic hits very few of your pages. And if you don’t optimize those pages for conversions and sales, you’ll absolutely regret it. Now I’ll show you how to find the most valuable pages, and what to do with them. How Do You Find Your Valuable Pages? And bam. You’re able to see what pages are getting the most traffic. (You’ll see a more detailed page listing all your top pages, and you can change it from listing 10, 25, 50, and more at the bottom right of the page). What Makes Those Pages Valuable? Quite simply, they’re the pages that get the most traffic, and if you optimize those pages to convert, you can potentially wring massive results out of them. For example, two of the most popular pages on DIYthemes are the WordPress SEO series and Nonverbal Website Intelligence Ebook. If you look at those pages, you’ll notice they look different than the rest of the blog. We optimized them to convert visitors into newsletter subscribers, and it has worked extremely well. Originally, they were regular blog posts, or regular WordPress pages that we changed after the fact to increase the conversion rates. Question is what else can you do? It doesn’t make sense to turn all of your popular articles into landing pages, like we did with those two pages. So keep reading. Before you begin optimizing, you must first decide the main goal of each of your pages. Once you know that, you can begin working. Let’s say you have a page that receives a ton of traffic. You can simply add another piece of content into the article that ties that article into one of your services or products. Before you begin adding a bunch of links, here’s a word of warning: you can overdo it, so don’t. Instead, simply add one or two links (if they don’t exist) towards the beginning of the post to new or related content. If you have to rewrite your intro to make it work, it’s worth it (you’ll get more pageviews, and potentially better seo). The headline speaks for itself. If you have a page that gets thousands of views a month, it might be worth it to create a special download for that page so you can convert traffic into loyal subscribers. This is a little more intensive, and to do that, you’ll have to mess with code. But as you might expect, if you use Thesis, we have a tutorial for that: how to create landing pages with Thesis. …Find more ways to send more traffic to that page. For example, here on DIYthemes we linked to the WordPress SEO tutorial in our navigation bar. And on Social Triggers, I link to my list building and online sales tutorials in my sidebar. 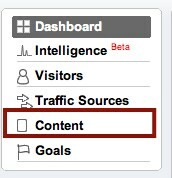 The reason why I channel traffic to those pages is simple: they convert visitors into subscribers extremely well. If we ignored them, the growth of the blogs would not be nearly as fast as it has been. Have you used similar strategies? Let us know in the comments.